India-based Micromax mobiles have collaborated with Modu Ltd. Of Israel to launch the lightest compact 3.5G touchscreen in India. Micromax Modu T is an incredible handset which has registered its name in Guiness Book of World Records for being the lightest touchscreen phone of the world. 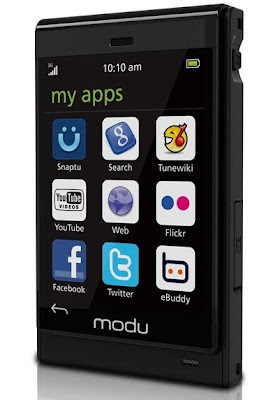 The two companies signed a deal yesterday and launched co-branded ''modu T'' phone in India. This phone would run on Aircel connection in the country. 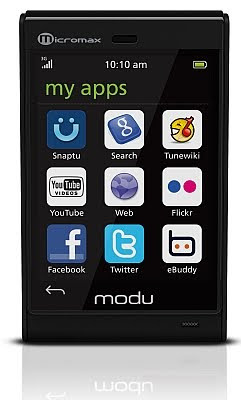 Micromax ''modu T'' is 3.5G touch phone that sports 2.2-inch screen. It has many more impressive features that make it a live example of an innovative gadget. This handset has very high-class features and functions which includes fast access to Internet, instant messaging and direct access to various social networking sites. It has GPS feature for allowing users to navigate through unknown places smoothly. The operating system of ‘modu T' is the Qualcomm's Brew operating system which let users use a variety of applications. Its memory is massive as it goes up to 2GB internal mass storage which may be expanded to 32GB via a microSD card. The multimedia features include FM Radio, MP3 player and an awesome 5MP camera. Targetted at the Indian youth who are ready to experiment and adapt to new range of gadgets, Modu T is one cool option for them. Modu Ltd. has plans to explore in other areas as well such as potential of tablet PCs in the Indian market. Micromax has an ever-growing portfolio in India and as such there are some 40 handsets in the kitty of Micromax which ranks fourth among the top five mobile handset companies in India. Its sales volumes were quite high during the month of January-June, 2010. The company sells more than 1 milion handsets every month in India and expects to export 1 lakh units abroad from October onwards. The mobile looks so great and I think it has some of the great features which can entice anyone to go for it. This phone has been awarded as the lightest touchscreen phone of the Guinness book of world record.